The sacred teachings of the Yungdrung Bön are so immense that they are said to be “vast like an ocean”. All of these many volumes are divided into two primary classifications. A scripture is either part of the ‘Ka‘, teachings given by the enlightened Lord Tönpa Shenrap Miwo, or they are part of the ‘Ka Ten’, teachings and commentaries based upon the words of Lord Tönpa Shenrap Miwo. 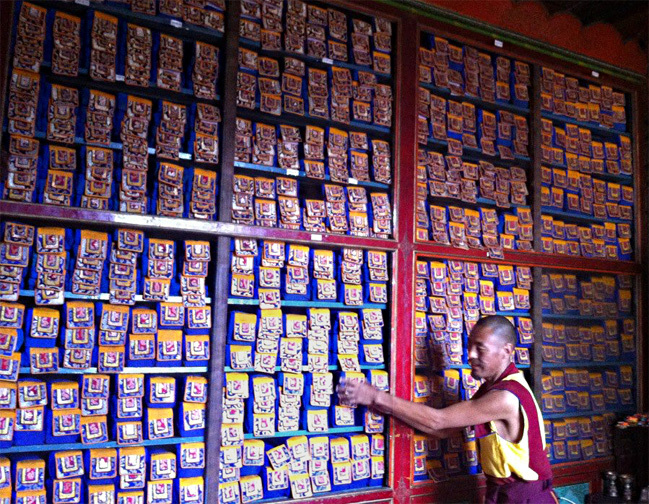 There are 175 volumes of texts within the Ka and over 300 volumes of texts within the Ka Ten. Posted on January 30, 2013, in Prayer and Ritual, Sacred Scriptures, Tibetan Language, Uncategorized and tagged Asian studies, Buddhism, prayer, religious texts, spirituality, tibet, Tibetan history, Tibetan Language, Tibetan Texts, yungdrung bon. Bookmark the permalink. Leave a comment.